1 The cemetery in the middle of the Queen Mary College campus. Never seen an on-campus cemetery before! 2 Participants in the ‘Show-and-tell versus show-don’t-tell’ workshop run by myself and Christina Courtenay. 3 and 6 The gala dinner on Saturday in the fab Rotunda library. 4 The ceiling in the library. 7 Laura James and Christina Courtenay. 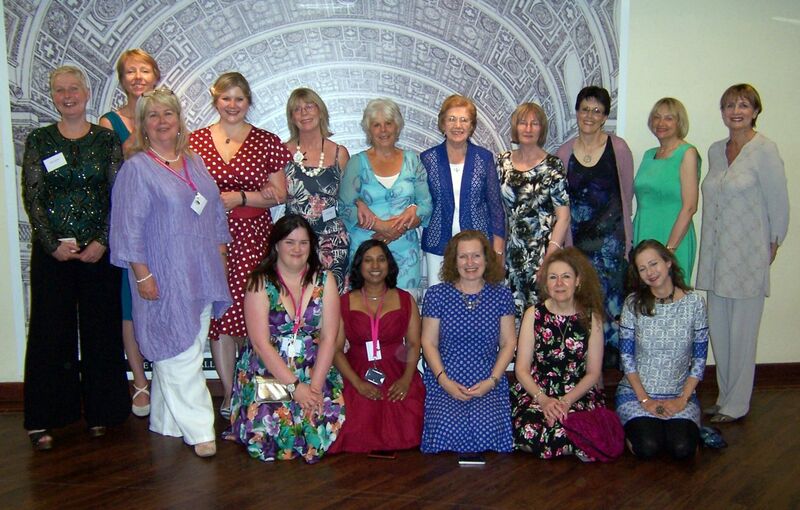 And my absolute favourite, courtesy of Janet Gover, the Choc Lit authors at the gala dinner. Back row, L-R: Jane Lovering, Sarah Waights, Kate Johnson, Sheryl Browne, Linda Mitchelmore, Margaret Kaine, Margaret James, Laura James, Evonne Wareham, Liz Harris. Front row, L-R: Janet Gover, Alison May, Rhoda Baxter, self, Christina Courtenay, Henriette Gyland. I would love to know what was the outcome of “show and tell” vs “show not tell” as this is an area that I struggle with and am trying to rectify!